My words come from an article read in the National Geographic Magazine of March 2013. Drones are something very important nowadays. They are used for wars and avoid to put many soldiers in danger. There are several sizes for the drones and tiny ones can view the positions and actions of the enemy's troops, then make better decisions. Drones are manufactured by several coutries especially the USA but also Germany; France is far behind and must get the US to lend us these machines. Americans now tend to avoid wars (and let France to make them). The article is about the civil use of drones which are no loger making wars. There are very interesting civil uses. In addition, improvements are continously performed so that some drones just have the size of tiny insects (or bugs or birds). The latest improvements consist in mimicking the behavior of the insects as well. The Pentagon has asked for drones that "hide in plain sight", mimicking the behavior -and size- of bugs and birds. "Nano Hummingbird": 6.5'' wide, 4.5'' long, 0.66 ounce of weight, max altitude secret, max time aloft 11 minutes, max speed 11 mph. "Draganflier X6": 36'' wide, 33'' long, 35 ounces of weight, max altitude 8,0000 feet, max time aloft 20 min, max speed 30mph. "Aurora Skate": 24'' wide, 19'' long, 35 ounces of weight, max altitude 14,300 feet, max time aloft 90 min, max speed 58 mph. Let me add drone can now fly without any human, not even in front of a screen and a joystick. Nowadays, it's still not permitted for a 100% automatic drone to shoot. Yes, drones can save lives. There are other usages and let's trust people to find out less helpful ones. You know, every new technology has got its dark side. I forgot to say there's another word for civil drones: Americans call them "MAV-Micro Air Vehicle". France (or rather Delta Drone) decided to open a school for civil drone pilots in Grenoble. -> http://www.techni-drone.com/?gclid=CIKI1cXByrYCFeXItAodvkIAEw didn't know there was this in Montélimar, good!! You have taught me something, Gérard ! ... in English language or re drones? Both ! I also like to open my mind on subjects I don't know anything about. MurielB a écrit: Both ! I also like to open my mind on subjects I don't know anything about. "café polyglotte sur le net" and all its members who write on it too ! 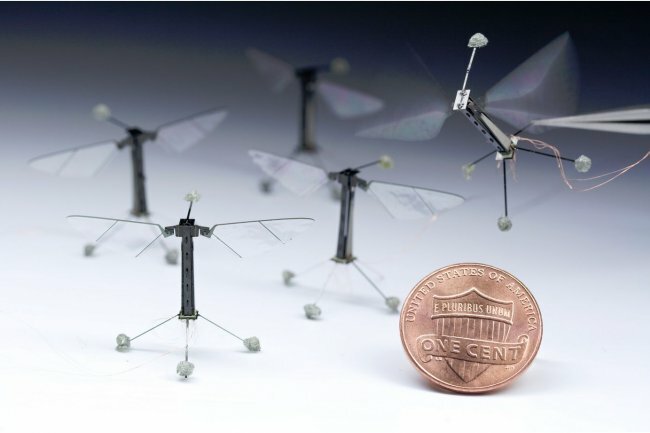 Harvard University researchers have conducted the first controlled flight of so-called "RoboBees," which weigh less than a tenth of a gram. Wasn't I speaking about tiny drones? Read the CBSnews article as there're other documents and especially several exciting videos. True that you couldn't confuse with a genuine bee but it's a part of the "hide in plain sight" project. Another important use (at least for me) is to approach a crazed gunman and know what their weapons are, when they are falling asleep, etc. The robobee displayed in the photo is a first version, the next ones will look like a genuine bee. > which is awfully important. Do you mean you approve? I would say it's awful, I mean I don't like this at all!! We read bees are absolutely necessary to the life on Earth, necessary to the whole food chain. Green associations fight Monsanto and similar firms which poison bees and other species, pointing out it is a critical insect and that Monsanto must be banned. I guess scientists nowadays just understand a few, a tiny part of the functions of bees (normal). If roboticists were allowed to design a creature able to pollinate plants, I'm sure it wouldn't be perfect from the beginning (normal). But... the result will be that the greens won't be permitted to bother Monsanto with killing bees (and this from the beginning). The result will be that the bees will disappear and in addition to extinction of this necessary species, robobees won't be able to replace them!! The bees place in our world is important beyond our understanding,I know. It must be difficult for roboticists to copy them. I just cross my fingers. What else can I do ? > What else can I do ? LOL Create a banner and go demonstrate! Hi Gerard ! Hi everyone ! i can see it's a joke what you have written but the subject is serious and you too think it's serious Gérard. Anyway if "All good deeds start at home" it is important to change our own ways. Take care of our Earth is very important for generations to come : our children, grand children, great grand children etc. What can we do? gardening without pesticides, buying organic fair trade products or local products, riding a bicycle instead of driving a car, walking as much as possible. at the same time I trust science and scientists. I am not amish whatsoever. Horrible news: La France va-t-elle acquérir des drones américains ? Is France going to purchase American drones? I think it's a horrible because the French are technically able to build the best planes and the best drones! The problem is that the French are never in a hurry (they think technics and rarely finances so that other countries are faster due to their economical aims). Hi Gérard ! Is it because France needs its drones rapidly and can't wait ? Anyway it is a shame because they cost so much. If France needs to get drones, it's because the US don't want to lend or rent them out. I may be wrong but I don't like this urgent need!! French Engineers are good enough excellent and with a bit of time we can manufacture drones! Pls Mr President, stop postponing problems and refuse research (I'm not criticizing Mr Hollande but any French President). The French are too often behind with problems... slowness was a part of our culture and well-being but it's no longer possible with globalization! Let's never forget, we've the best engineers: let's take advantage of our skills! I'm afraid that if we urgently need drones that could be to lead another war against Syria!!! My daughter from Paris has just lent me "holocaust" which is a documentary about world war II. It is awful ! because people were mad 50 million people died. Like everyone else I hate wars because I think they are useless. With leaders from different countries, there are always secret agreements. Perhaps because of those France had to buy the drones ? -> Drones : des modèles made in Europe ? Sure Europe is able to manufacture... it's time to help European economy. That's sure! France missed the appointment!! Fed up with politicians who are unable to foresee... they hardly deserve SMIC!! Le FBI, la police fédérale américaine a confirmé l'utilisation de drones sur le sol américain par la voix de son directeur, Robert Mueller. "Nous avons très peu [de drones], d'une utilisation limitée, et nous explorons non seulement leur utilisation mais aussi les lignes de conduite nécessaires à cette utilisation", a-t-il précisé devant la commission de la justice du Sénat. Le département de la sécurité intérieure a lui aussi recours à des drones pour surveiller notamment la frontière des Etats-Unis avec le Mexique.